This small handbag is fashionable. It is ideal when you don't want to carry a large, bulky purse. Convenient to organize your stuffs like money, keys. And lightweight to carry with when outdoors. A great casual purse for everyday use whenever you only need few essentials and to grab and go. Frees your hands and shoulders from big and bulky bag. Or Just as a cell phone pouch to protect you phone from scratches in the bag. Nice Cute clutch purse handbag. A valuable and useful safe-keeper. The nylon fabric material and sturdy stitching makes it durable and lightweight to carry and clean. It has a big main zipper outside that is very easy and smooth to close/open. It has 3 separate compartments and in the middle compartment has a little zipper to securely hold your valued items. This bag provides enough capacity for daily carrying including cell phones,cash,credit cards,small cosmetics and other staffs. Three layers design for better organizing your stuffs. It is suitable for wristlet handbag,single shoulder and crossbody carrying with the adjustable shoulder strap.The waterproof nylon shoulder bags keep up with your daily activities while looking fabulous and remaining hands free. ROOMY CAPACITY TO ORGANIZE YOUR PERSONAL ESSENTIALS - With 3 layers construction,the multi-function wristlet handbag safely conceal and store your personal belongings,such as Cell Phones(below 6 inches),small cosmetics,Bank/Credit Cards,ID,Cash,Coins,Keys,Gum and ect. MULTIPLE WAYS TO WEAR & CONVENIENT/PORTABLE - The Multi-layers Crossbody Handbag comes with a Removable Wrist Strap and a Removable & Adjustable Shoulder Strap.Both Ladies and Little Girls can wear it Around The Wrist or Crossbody.Awesome for walking,shopping,sporting events or kinds of festivals. COMPATIBILITIES:it fits for Apple iPhone 6 plus,6s Plus,iPhone7/7S,Iphone 6/6s/5s,Samsung Galaxy S6/S5,Note 5/Note 4,HTC,LG G4 and any cell phones less than 6 inch. 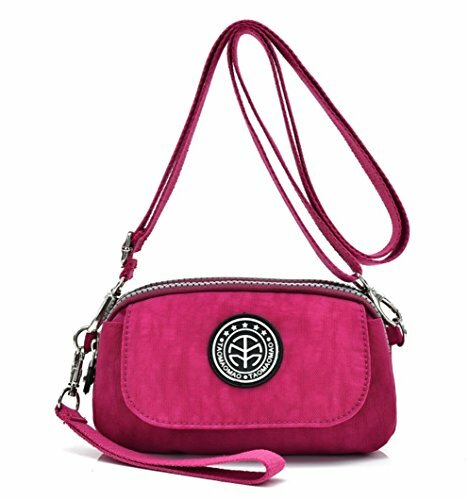 DEMENSION: 7.1"L x 4.3"H x 2.4"W. Small but Roomy wristlet purse for women and girls.